As a gunsmith, I've been known to rant and rave on more than one occasion about the constant flow of "new and improved" guns appearing every year. On one hand it often seems to be just another way to sell something new. After all, the "old" model you have is no longer "up to date," and if you believe some folks, you're an idiot or at least someone stuck in the past if you don't run right out and buy the latest offering. In truth, it's a good thing manufacturers constantly work on new products. After all, that's how we progress and get better guns. What if Remington had stopped with the Rolling Block or Winchester had decided the 1876 lever action was the peak of gun design? We sure would have missed a lot of great guns. Just a few years ago, in 2005, Smith & Wesson introduced its new M&P series of semiautomatic pistols. This line replaced the older SW99, which had been in production since 1999. The SW99 was a joint venture between Smith & Wesson and the German arms maker, Walther. This was a most unusual situation in which Walther made the frames and internal components while Smith & Wesson produced the slide and barrel. The assembly of the pistols was done here in the U.S. at the Smith & Wesson plant. At the same time, Walther was selling virtually the identical pistol in the U.S. as the Walther P99, and it's interesting to note that the P99 sold for about $150 more than the Smith & Wesson. Now don't get me wrong. The new M&P pistols, which are made entirely by Smith & Wesson, are darn nice and seem to be very popular. The ones I've had a chance to shoot have been just great. I'm happy for the folks at Smith & Wesson and for the gun owners who purchased the new M&P pistols. In fact, if I were given the chance to choose to between a SW99 and an M&P for the same money, I would definitely go with the M&P. But with that said, what about those older guns the M&P replaced? Should the owners of the SW99 get rid of 'em? Are they no longer usable? What about the used SW99s showing up on the surplus or used market? Are these good buys as shooters? Are they destined to be collectible? First, let's take a look at this pistol. To be honest, like so many modern semiautomatic handguns, it looks a lot like just another Glock clone. It has a polymer frame, a steel slide and a somewhat square or angular appearance. There's no exposed hammer. Instead, the SW99, like the Glock, uses an internal striker or firing pin. When the trigger is pulled, it cams the striker back and then releases it. Although the pistol was offered in three calibers--9mm, .40 S&W and .45 ACP--most of these pistols you'll probably see are 9mm. The standard magazine capacity in 9mm is 16 rounds; .40 S&W, 12 rounds; and .45 ACP, nine rounds. The barrel length on the most common 9mm version is about four inches long. Both night sights with glow-in-the-dark inserts and plain iron sights were offered. In addition, there's an integral accessory rail on the frame directly ahead of the trigger guard suitable for mounting a light or laser. The SW99 also had a feature that was unusual at the time: interchangeable backstraps. Walther came up with the idea of offering small, medium and large backstraps to allow shooters to fit the grip to the size of their hands. Pinned triggers move in an arc and can leave finger-trapping gaps along their travel. The SW99 solved this with the "ski bump" trigger guard. As with most pistols marketed to law enforcement, there was a heavy emphasis on making it as safe as possible. The rear of the extractor on the right side of the slide can function as a loaded-chamber indicator that you can both see and feel. The rear of the striker has a red ring painted around it, and it protrudes through the rear of the slide when the pistol is cocked--another visual/tactile indicator of the pistol's readiness. There's also a decocking button on the top left side of the slide. It allows the user to safely lower the striker with a loaded round in the chamber. Finally, the pistol can be fired only by pulling the trigger completely to the rear for a total trigger travel of about one inch. You have to really want this gun to go off to get it to fire. The SW99 employs a rather unique magazine release. Instead of the traditional button you press in to release the magazine, the SW99 has two levers located on either side of the bottom rear of the trigger guard. 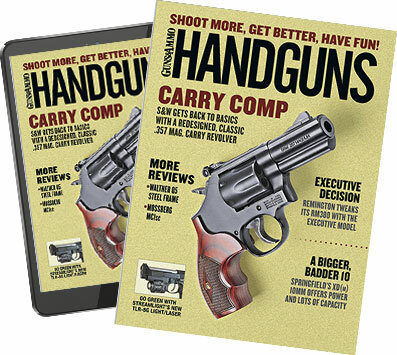 To release the magazine you just push one of the levers down. Since they're located on both sides of the trigger guard, Smith & Wesson touted this as an ambidextrous mag release. It works quite well, but for someone accustomed to buttons it can take some getting used to. Another unusual feature found in the trigger guard is a projection, sometimes called a "ski jump," located in front of the bottom of the trigger. It looks odd but it has a very practical application. Unlike the Colt 1911 trigger, which moves straight back into the frame, the top end of the SW99 trigger is pinned to the frame. Because of this, it moves in an arc. This means the end of the trigger must be located at a greater height above the inside of the trigger guard at its forward or rest position than it would be at the end or terminal point of its movement. You can't put an arc against a flat surface without having gaps. This is not unusual as many modern double action automatics have this characteristic. The problem is you end up with a gap under the end of the trigger. In some pistols you can literally jam your finger into this opening. Some handgun makers have solved this problem by curving the bottom of the trigger guard to somewhat match the arc of the bottom end of the trigger. In the SW99, Smith & Wesson and Walther solved it with the ski jump. It guides the shooter's finger onto the trigger and fills that annoying gap. Heckler & Koch also used a smaller ski jump in some of its pistols as well. And, yeah, it looks odd. The pistol is often sold as being ambidextrous, but I would have to disagree. Yes, the mag release can be used with either hand, but the slide stop is only on the left side of the frame. The decocking button is on the top left side of the slide. While you can reach it with your right thumb, a left-hander may have to use his right hand to comfortably depress it. Also, like almost every semiauto pistol ever made, it ejects to the right. That's great if you're right-handed but if you're a lefty, you're going to get some hot brass thrown in your direction. Also, for guns with windage-adjustable night sights, the adjustment is on the right side. All in all, it does have some left-hand-friendly features, but it's a long way from being a true left-hand or ambidextrous pistol. Since the SW99 was marketed heavily to law enforcement, it has a lot of safety features such as red-painted cocking indicator. One of the best features of this pistol you won't see unless you take it apart is the construction of the chamber. Unlike so many other handguns, including the standard 1911 Colt, the SW99 fully supports the cartridge case. The bottom rear of the case just ahead of the rim cut is supported by the barrel. It has not been cut away to facilitate feeding as in many other handguns. This means you're a lot less likely to have ruptured or bulged cases. The steel slide is actually stainless, but it's coated with the Smith & Wesson proprietary Melonite finish. To describe it as tough is a gross understatement. I've never run across a used SW99 with a rusted or pitted slide. When combined with the polymer frame, there's just not much to rust. It's definitely a gun designed and built to keep on tickin' even if the user fails to provide appropriate maintenance. Although I've been gunsmithing for about 30 years or so, I'd not had any firsthand experience with the SW99 until I bought a used one not too long ago. Prior to that, none had ever shown up in my shop. Consequently, I was quite eager to try it out and see just what it was like. It took a bit to get used to the long trigger pull. Fortunately, I spent many years shooting with two-stage military triggers on Garands, M14s and assorted military bolt actions. It didn't take long until I could take up about 75 percent of the trigger movement and then concentrate on that last critical 25 percent. The SW99 barrel (l.) provides more support for the cartridge case than a standard Colt 1911 barrel, preventing bulged or ruptured cases. Again, it was a lot like taking up the slack on those old two-stage rifle triggers. Now don't get me wrong; it'll never be like shooting a match-tuned 1911 or even the new M&P model, but I can live with it. The recoil in my 9mm was not at all unpleasant, even though the gun only weighs about one pound, nine ounces. I credit this to the ability to change out the backstrap so it truly fits my hand. In fact, I would go so far as to say this gun fits and feels more comfortable in my hand than any other handgun I own. That says a lot, and to do so without expensive, custom-made grips is pretty remarkable. As for accuracy, the SW99 will shoot tighter groups than I can hold. At 15 feet it'll put just about all my shots into one ragged hole. At 10 yards, shooting from a standing position, it'll put my shots into about a 21/2-inch group. Not bad for an old guy with bifocals. I'm certain better shooters could turn in tighter groups with this handgun. How many guns do you know of that have not one but two arms manufacturers' stamps? The author couldn't think of an example other than the SW99. All in all, Smith & Wesson and Walther seem to have put together a darn good pistol. Sure, there are some features that could be and were later changed in the M&P, but this pistol has established a great reputation for service and durability as a police handgun. That alone is a pretty impressive. Consequently if those of us who are just civilian shooters and gun owners are looking for a good serviceable striker-fired semiautomatic pistol, the SW99 is definitely one to consider. The model may have been replaced with something newer, but it's still capable of providing excellent service and is a long, long way from being obsolete. I have seen used SW99s sell from $325 to $400 or so while used M&Ps regularly sell for $500 or more. You might also want to consider the possibility that in the years to come the SW99 may well evolve into a fairly desirable collectible. It was in production for only about six years or so, and for a major manufacturer such as Smith & Wesson, that is a very short production run. Generally, the shorter the production run, the fewer units produced, and the value of a collectible firearm is often directly related to production numbers. The fact that this pistol was a joint project between two of the greatest firearms manufacturers in the world gives it a uniqueness few other guns can claim. In addition, both partners in this project marked the gun with their name. How many other guns do you know of that have two arms manufacturers' names on it? I cannot think of a single one. Coffield's used SW99 turned out to be a nice handling, accurate pistol. In addition to its serviceability, one day it could be a collector's item, too.